These Custom Printed Bingo Slide Cards Feature Your Logo on the Bottom of Every Card! Our Five-Ply Custom Bingo Fingertip Slide Cards are available with the one to four color imprint of your choice. The Bingo Cards feature easy-slide red windows for marking the Bingo Numbers on the Card. 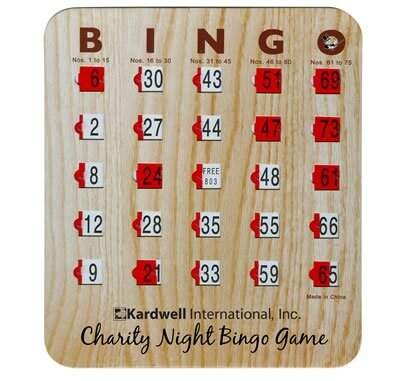 Made of durable wood grain color cardboard, each Bingo Slide Card measures 6-11/16 inches across by 7-1/2 inches high. The minimum order for Custom Printed Bingo Slide Cards/Window Cards is just 200 Cards. NOTE: For regular, non-imprinted Bingo Slide Cards, please visit our Bingo Slide Card Page.